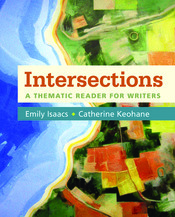 Built around compelling readings and topics that students care deeply about, Intersections offers flexible academic reading and writing instruction that supports students without overwhelming them. Intersections offers eight chapters of timely readings—forty-eight in total-- with themes like Sports in American Society, Immigration, and Language and Identity, that keep students interested and spark ideas for their writing. Carefully structured reading and writing questions and discussion prompts before, during, and after the readings guide students as they move from comprehension toward critical thinking and inquiry. These core thematic reading chapters work in tandem with innovative modular Toolkits on Reading and Writing that cover key skills such as note-taking, summarizing, peer review, MLA documentation, grammar, and much more.